That's an interesting note about the seat, dutik. 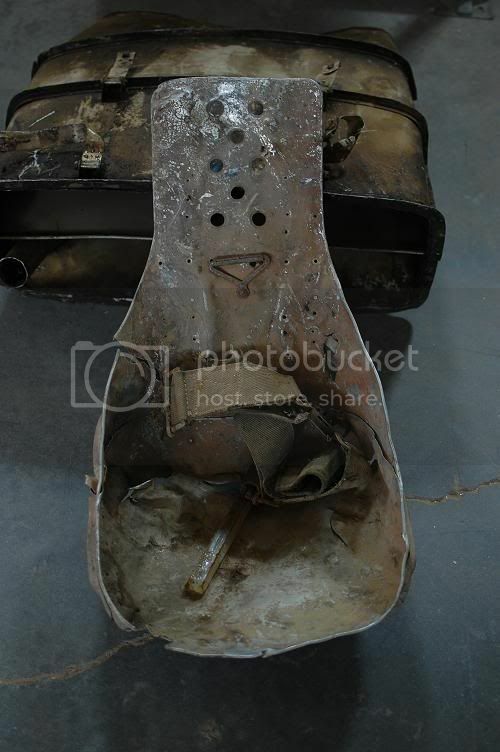 Below is a picture of a seat from an unrestored IL-2 wreck at the Pima Air and Space Museum. The wreck is a two-seater, although it's hard to tell whether it's a straight-winger or an arrow as the wings aren't attached. At any rate it's a later Shturmovik (i.e., a two-seater as opposed to a single-seater). Note that it has the narrow back and wider, integral seat pan like the seat in the Hobby Boss kit. Does your I-16's seat(s) look like this? Yes. And no. There are two seats, plastic and resin. The plastic one looks like the one shown above - minus the holes (some minor drilling required). The resin one has a cushion for the back, so it looks much wides. But at the backside is a narrow backrest too. But this will be invisible once the resin seat is installed. Than it will look like an armored one. The whole thing is confusing. What I understand - from books and articles - is that the early I-16 had the narrow seat. Mark 5. And there was a gap between upper backrest and headrest. The later got an armour behind the seat/ or an armored seatback. First 8, later 9 mm thickness. No gap there between backrest and headrest (makes sense, to avoid unprotected areas). This armored sea looked different from the early model and had a wide, shell-like backrest. At least by judging drawings from the net and russian magazines. But I am short on real sufficient sources about the I-16. Just a fes magazines and some books about its stablemates (I-5 to I-153). Hmmmm... Confusing. My guess is that the restored bird is not the real McCoy. There are boxed in wheelwells visible at a lot of period photos as well as the preserved Mark 5 one. Even the drawings of the I-153 (by Maslow) show such a feature. That is still not an answer about that frontal floor. But a hint? Has anybody drawings or images at hand? The I-153 definitely had boxed-in wheel wells. I've seen a wartime picture of an I-153 perched on its nose, clearly showing these. That is curious about the New Zealand bird, but since those Polikarpov's were as much reproduction as restoration, that open wheel well is almost certainly not an original feature. Given the rough nature of the airfields the VVS often operated from, it would make no sense to have a wheel well open to the cockpit, where the pilot could get liberally sprayed by water, mud, stones, etc. I'll check my I-16 references to see if I can confirm this, dutik. Well, dutik, I had a look through a large book on the I-16 by Polikarpov expert, Mikhail Maslov and this is what I found. 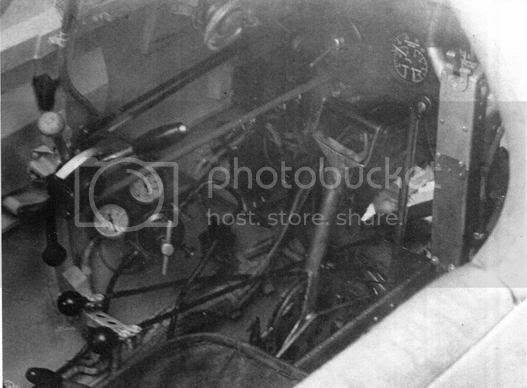 It's a picture of a cockpit from when the I-16 was in service (a type 29). Maybe you can figure out what's going on in the cockpit. Thank you. Is it a russian book in russian language? You're welcome, dutik! Yes, it is Russian book titled "Istrebitel' I-16" in Russian. It does look like you can see straight through the wheel wells on this photograph. That is strange. I thought the wheel wells were always completely enclosed. It still doesn't make much sense to have it open like that. Especially since, as I posted earlier, the VVS operated so often from unprepared airfields. I wonder if it had anything to do with the installation of the UBS on the underside of the type 29. Got the AKAN paints today. Didn't open the bottles yet. I ordered what was available: the "until 1941" and "1943-1945" sets. Acrylic paint. Both sets contain A-14 "steel grey" and A-II red. "1941" yellow-gray (canvas), dark grey (the "black" camo stripe colour? ), A-II blue, A-II green. "43-45" AMT-11, AMT-12 (upper side camo blue-greys), AMT-7 (blue) and White. At every bottle is a small text describing some major types that used that particular colour or where it was applied (underside, inside cockpit etc.). The underside blues have a different look inside the bottle. A-II blue is a lighter, whithish or greyish blue, while AMT-7 is just "plain middleblue"
Dutik, I'm curious about that dark grey. The AMT-6 Black should be labelled as black. Is this dark grey labelled as "AMT-6" and could you post a swatch of it? I'm curious as the dark grey I know about was the AMT-12 Dark Grey, which was used on both fighters and IL-2's. I have read that the AMT-6 Black was sometimes described as a grimy black, or a weathered black, almost a very dark grey, but I don't recall seeing it described simply as dark grey. 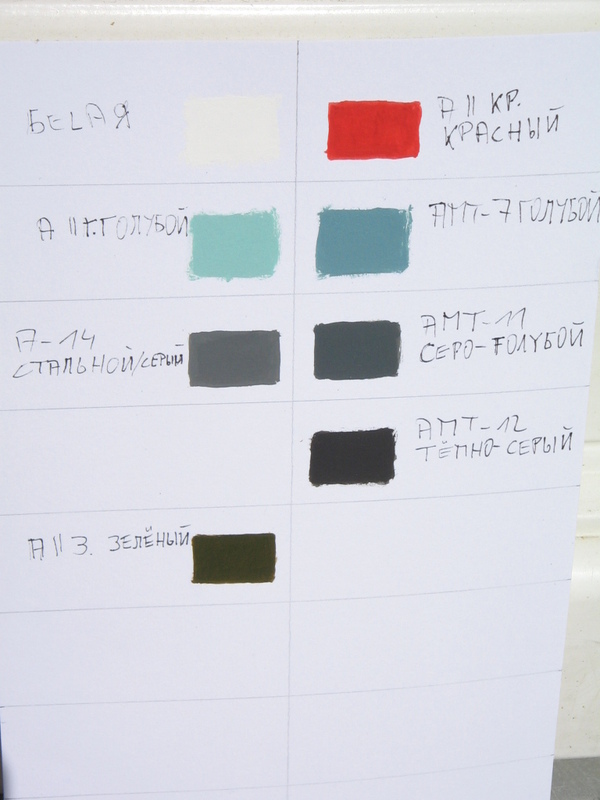 Dutik, I just read your post again and noticed that the dark grey was from the pre-1941 paint set. That rules out AMT-6 Black. That dark grey paint should not be used for black stripes on the black/green camouflaged aeroplanes. AMT-6 Black only was used for that. I have no idea what that pre-1941 dark grey was used for as I'm mainly interested in GPW colours. Hopefully you'll be able to find the 1941-1943 paints from AKAN. Given that AMT colours were introduced 1943 and black stripes were a common camouflage at the beginning of the war there must be some kind of black paint. A-II type or sans prefix. I will figure out what that dark grey is intended for. I am also on the way to subscribe to an image hoster to link images to the forum. I. e. I will make paintchips of my AKAn paints on white cardboard and take images (outside) to post them here to show you how the colours look like. Dutik, the AMT colours were introduced in 1941 as replacements for the AII paints. AMT-6 would have been the black used for the stripes, even if painted directly over AII Green (AII Z), as happened early in the GPW. Other than being painted over the old AII Green that was already present on pre-war planes, it was used with AMT-4 Green. I do look forward to seeing the samples of the AKAN paints as I've never used or purchased them myself. Yes, you are right. Introduced 1941 and making it into large scale use in 1942/43. Mixed this up while writing without my bookshelf at hand. Pulling the dark grey paint bottle out of the blister reveals the label with the writing: "Staraya resina". Translated: Old rubber. Suggested to be used with the F-117 (yep, that stealth plane), SR-71, Ka-50 heli and submarines too (among some others). Ok, we need some paint to paint the tyres. But a whole bottle? I am confused. Maybe a black or another kind of primer color would have been a better choice? Hint: Buy the needed paints in single bottles. At least the pre-1941 set is somewhat odd mixed together. As for the black stripes I will use Nato black (Tamiya) for my bird. Should fit well. p. s. Luckily I also have some kits of WW2 soviet submarines at hand to use the grey paint. I hope it works. My first try with an image hoster. My new computer is also lacking any kind of photoshop programm (hrrg...), so I am not able to cut the image to fit. Pro: This is the true photo made in sunny conditions without flash. The AMT greys look really dark. there is a visible difference in the paint bottle and also in the sunshine, but in the shadow this difference is vanishing. That effect was noted at different online discussions about AMT-11/12 camouflage too. AMT-11 is not as blue as expected. Maybe I didn't stirr enough the paint? A-II Green is more a Khaki. The paint had separated inside the bottle into a dark tone and a yellow-brown one. Colours look very dark. I guess they would look somewhat brighter at larger areas. Think about the scale effect. edit: Yep, linked the wrong image first. May the force be with you! Do you know what you see? Yep, that kind of seat from your image above. I came across Maslovs book about the the I-15 too. Image no. 90: Our little friend, the seat. Estimated guess: this was the standard equipment for military airplanes of that time. Simple, rugged, lightwight. An armored seat was not a feature of the early fighter aircrafts, and not needed for the "flying tank". Interesting, dutik. It does appear to be some kind of "standard" VVS seat.